I love an intoxicating scent. (Okay, really, who doesn't?) But there's just something special about NEST Fragrances Wasabi Pear Body Wash. I've actually long been a fan of this scent in candle form, so when I discovered it existed as a body wash, you'd better believe I snapped it up IMMEDIATELY. And while I have about 16 body washes in rotation at any given time, recently this is the only one I've wanted to pick up. It's fresh, it's heady, it's a little bit spicy ... it's pretty much exceptionally divine. Notes of anjou pear, green apple, jasmine and wasabi essence are at once sultry and alluring. Plus, you only need about a dime-sized amount upon your pouf to create a rich, foamy lather. Amazing, right? 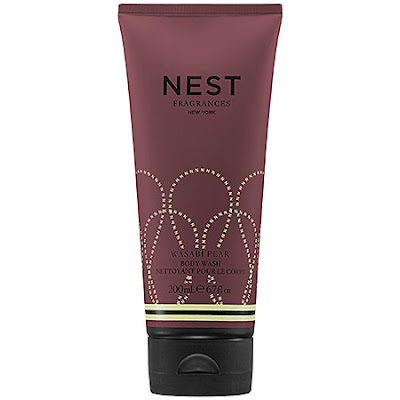 NEST Fragrances Wasabi Pear Body Wash retails for $28 at sephora.com. I haven't heard of this scent but it looks very good!